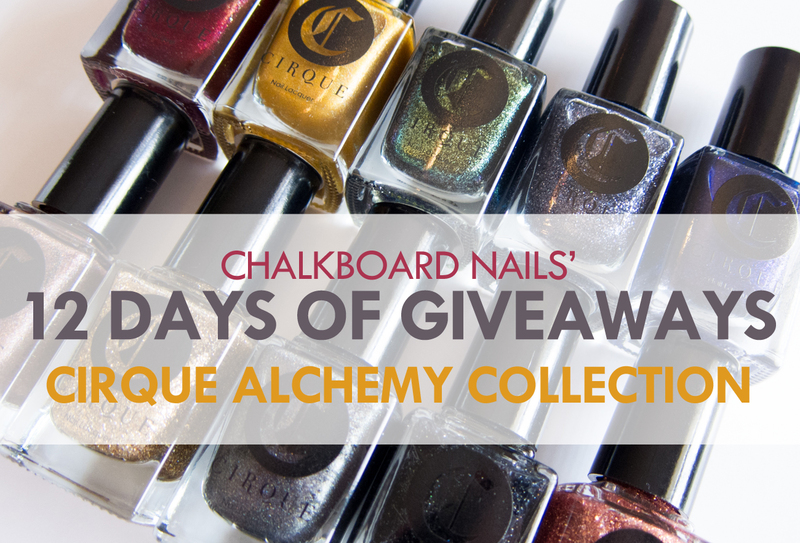 It's day three of the 12 Days of Giveaways and I have an opportunity for you to win some polishes from one of my favorite indie brands: Cirque! One lucky winner will get to enjoy the full ten piece Alchemy Collection, compliments of Cirque. Look at those gorgeous polishes! 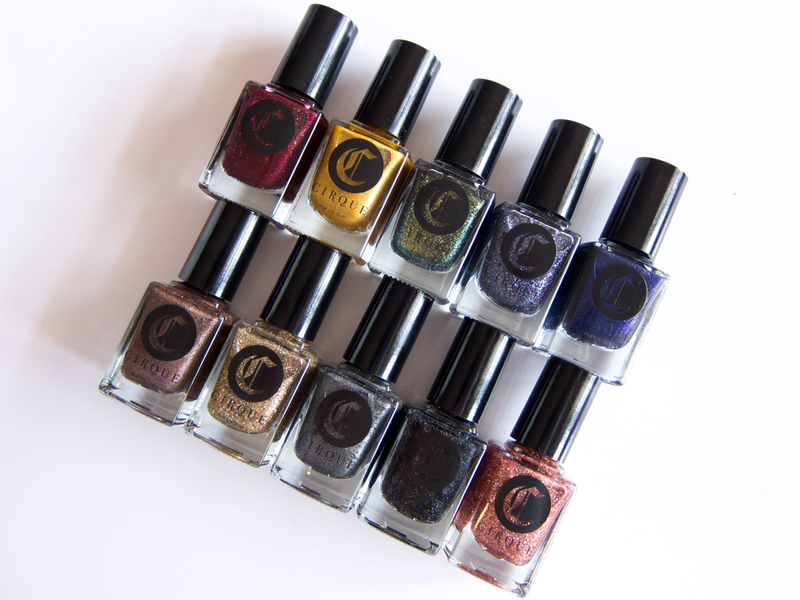 Such a wonderful blend of shimmers, glitters, holos, glass flecks... what more could a polish lover ask for? I haven't swatched these just yet, but I DO have them in my possession and I can tell you they are divine. Look out for a swatch post soon, but for now just trust me -- you want these babies. Read on and enter to win! Please enter using the Rafflecopter widget below. Must be a follower of Chalkboard Nails to win. Must be 18 years of age or older, or you must have your parent's permission to enter. This giveaway is open internationally excluding Brazil, India, Italy, and Russia, and closes on December 17, 2013. Prize will be shipped by Cirque. The winner will have 48 hours to claim their prize, after which a new winner will be chosen. OMG - this is a DDRREEEAAAMMM giveaway!!!! ;) Thanks so much for offering it! I feel like it's Christmas just staring at those polish lovelies, lol! I screamed at this. I would give my left kidney for this giveaway. I would definitely wet myself if I won. No shame. I've been dreaming of owning some Cirque colors. Thanks for the great giveaways!! Oh my gosh, this is BRILLIANT! Oohhh, I want! Cirque makes such beautiful polishes! So long as I have a US shipping address, can I enter the giveaway (I'm from Russia)? I hope I get lucky for once! Wow, YOU are the real Santa !! :) Thanks ! Ooooooh ahhhhh.....I've never seen this brand before. Wow, whatTa great giveaway. The colours are to die for. I'm following you in this giveaway... Thanks, girl. You're the number one. *drooling* thanks for the opportunity...best of luck everyone....hope everyone has a safe and happy holiday season. THE dreamed giveaway ! Figners cross and with christmas magic it should work !!! Oh i do hope to win! Just started a nail blog and always looking to increase polish collection. Trying a new a brand who seems to make such beautiful colors, would be a dream come true!!! I didn't got excited over nail polish the last year but this collection got my attention from the first time I saw it. I would love to win one of these awesome nail polishes!!!! thanks for hosting the giveaway.